The main purpose of the two-year Master’s of Science programme is to provide postgraduate students with detailed knowledge, critical understanding, strategies and the tools required to take an interdisciplinary approach towards environmental risks and human security. The Master’s programme addresses theoretical and methodological debates in geography to better understand the complex emergence of environmental risks and natural hazards and their implications for human-nature relations (vulnerability, resilience, adaptation) and how to deal with them in practice. As a joint programme by the Department of Geography of the University of Bonn and the United Nations University in Bonn, the course provides a unique combination of advanced conceptual and applied engagements with the field of environmental risks and human security in an international context. Since its launch in October 2013, a total of 143 students from 42 different countries have been studying within the programme. The Master’s programme offers great visibility and exposure to international organizations, federal agencies, academic and non-academic research organizations, as well as private companies and corporations involved in disaster risk reduction and preparedness, humanitarian aid, international relations, research on climate change, food security, spatial planning, and policy. Future career options may arise in all of these thematic fields depending on individual preferences and career goals. Physical Geography, Geosciences and Environmental Sciences with a focus on Earth System Science. A strong motivation to contribute to the area of human security and management of risks related to environmental change is a prerequisite to study in this Master’s Programme. Applicants should be highly motivated to learn in a multicultural and interdisciplinary environment. Non-native English speaking applicants must prove proficiency in the English language. For further details on the application requirements, please consult the FAQs. 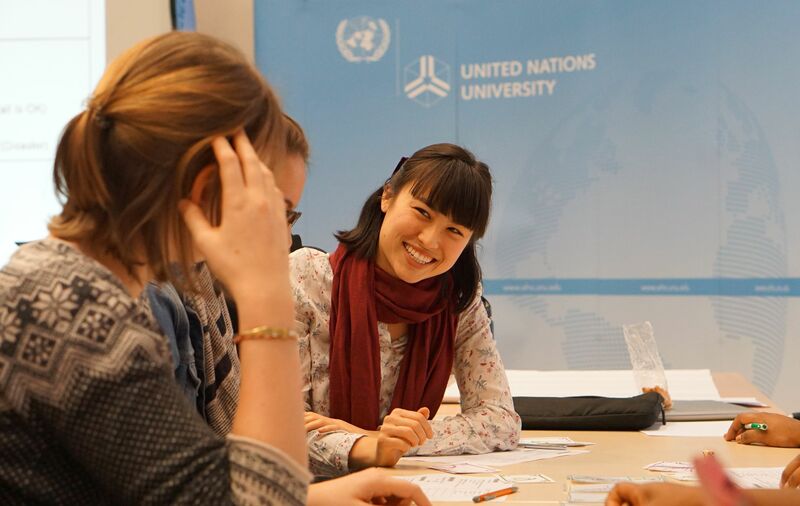 UNU-EHS and the Geography Department of the University of Bonn welcome applicants who possess a first degree (Bachelor’s) in a higher education programme in Geography or a related discipline. The ideal candidate has a strong interest or experience in working in the field of human-nature relations and risk governance in the Global South. Applicants from developing countries are strongly encouraged to apply. The Joint Master’s Programme has an annual intake. The next programme will start in October 2019. Applications are accepted during the application period from November 2018 to 15 January 2019. An up to date Résumé or CV including a chronological listing of employment and other significant activities must be submitted with your application. Make sure your CV information corresponds precisely to the certificates and letters of recommendation attached to your application! A written statement, one to two pages in length, describing motivation, area of proposed research, background, past work in the intended field of study, plans for further postgraduate study and any other information that is relevant. Applicants who are currently registered in a postgraduate programme at another university should explain why they wish to change programmes. In cases where the transcript is written in any other language than English, a certified translation of the transcript into English is also required. Translated versions can be certified either by the originating university or an official national or international institution. The certificates must correspond chronologically to the info reflected in your CV/ Résumé. Only digital versions sent via email will be accepted. We do not accept applications sent via post. Completed application packets must be received before the application deadline = January 15th, at 23:59 CET (Central European Time) for Bonn, Germany. All candidates get a notification on their application status by mid May 2019. For additional questions that are not covered by the FAQ, please contact: master-georisk@ehs.unu.edu. This Joint Master’s is part of a selected group of international postgraduate programmes that benefits from the EPOS funding scheme offered by the German Academic Exchange Service (DAAD). We will be able to offer a certain number of fully-funded scholarships to students from “developing countries” for the student intake from 2017 onwards. Students wishing to be considered for these scholarships need to apply for the programme as well by submitting a separate application pack (see APPLICATIONS section, requirement no.9); acceptance to the former does not guarantee acceptance to the latter. A list of available programmes can be found here. The international MSc-Programme is taught equally by members of staff from the department of geography at the University of Bonn and researchers from the Institute for Environment and Human Security at the United Nations University. Fields of expertise include Vulnerability Assessment, Ecosystem Services, Sustainable Development, Disaster Management, Climate Change Adaptation, Human-Nature Relationships, Science & Technology Studies, Development Geography, Geomorphology, Socio-Hydrology, Future Studies, GIS and Remote Sensing. The Programme consists of 11 modules of which nine are taught in the first three semesters, followed by a compulsory internship and the independent work on the Master’s thesis. For an overview of the Modules please click here.